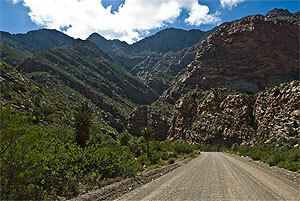 Ladismith is situated in the Klein Karoo on Route 62, at the foot of the Klein Swartberg mountain range. The majestic Towerkop, with its split peak, looms above the town. Local legend has it that an angry witch, flying over the mountain during a stormy night, found the peak obstructing her way, and in anger struck it with her wand, causing it to split in two! The Dutch Reformed congregation was founded in 1851 and the town was established in 1852 on a section of the farm 'Ylandsvalley'. Named after Lady Juana Smith, the Spanish-born wife of Sir Harry Smith, Governor of the Cape Colony. The original 'Ladysmith' was changed to 'Ladismith' in 1879 to prevent confusion with its namesake in Natal. It serves an extensive farming area with ideal climate for the production of apricots, peaches, plums, nectarines and grapes. Approximately 30% of the total apricot export market comes from the district. There are two cheese factories as well as a winery. Ladismith, as with the rest of the Klein Karoo benefited from the ostrich feather boom period at the beginning of the 20th century. This opulence attracted several Jewish families from the Balkan states and at one stage in the early 1900's there were about thirty Jewish families living here. A synagogue as well as a school was built. 12 km east of town on R62. Breathtaking views in spring and autumn of vineyards and orchards. Spectacular rock formations loom on both sides of the road winding for 17km through the Klein Swartberg mountains to emerge on the northern side in the Karoo. West of town on the Laingsburg road. 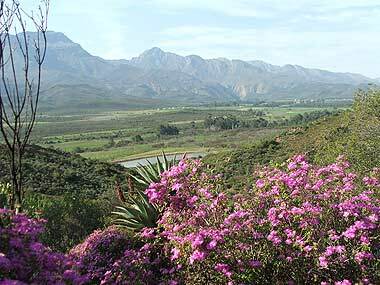 Picturesque valleys with orchards, vineyards, dams and old farm houses. Winkelplaas, Vensterkrans See the awesome damage that was inflicted by the great Laingsburg flood in January 1981, when the railway line was washed away. 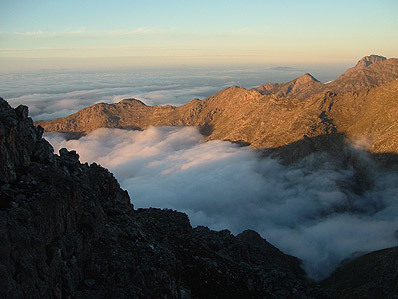 2 189 m - Although not the highest peak in the range, it is the most well-known and difficult to climb. 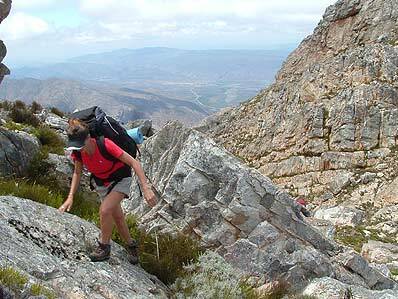 2 325 m - The highest peak in the Klein Swartberg as well as in the Western Cape. Springvale: 15 km - West of town off the Laingsburg road. 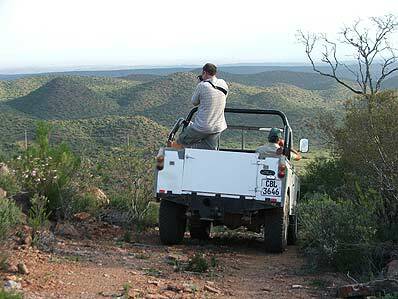 Runs along a game enclosure where several species of game can be seen, as well as an abundance of birdlife near the dams in the enclosure. 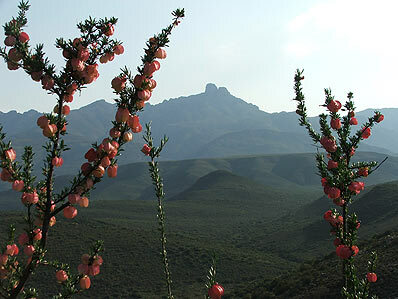 Typical Succulent Karoo vegetation in the hills. Tennis, golf, badminton, squash, rugby and cricket. The town and district boast several building styles from bygone eras. Several buildings have been declared National Monuments. The town also has its own unique building style - a simplified Georgian style, the so-called 'Ladismith' style. Other styles include Victorian, Neo-Gothic, Lithuanian, Edwardian, Cape Dutch Revival, Regency and Rural (Karoo). Afrikaans is rooted in the languages of 3 continents - Europe, Asia and Africa.